It's on my tuit list. Is it fun to make? Did you find any issues? Yours looks wonderful. Thanks for your comment. I like to crochet novelties so it's fun to make but it takes a lot of work and time. I crochet loosely, so after making the giraffe & tree, I went down a hook size. 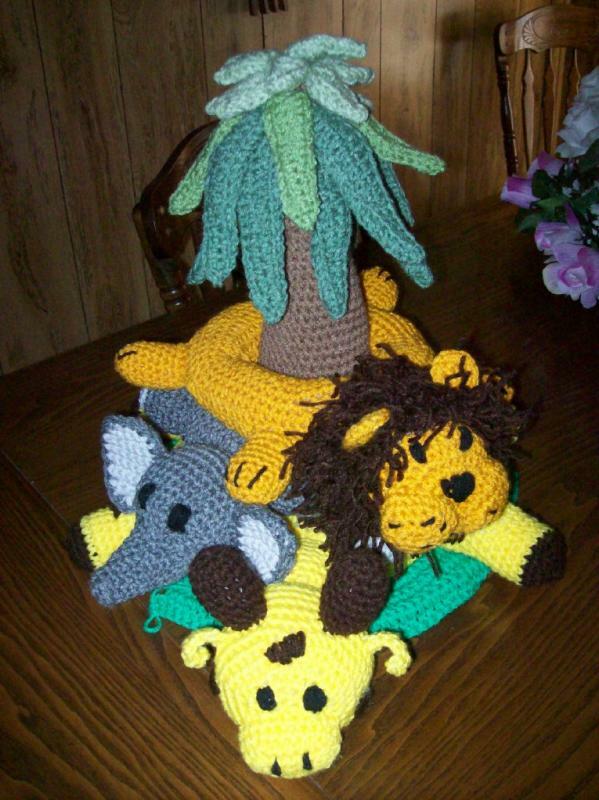 My friend is crocheting one too and her's is a lot smaller. I didn't like the color of the giraffe so I made mine yellow with brown spots. I also can't make loops so my grass with be latch hooked. I had issues with the leaves too but I worked it out........not complaining, just venting. I have seen that pattern, and have it on my list to do. It is just so cute. Thanks for your information I'll keep it all in mind when I get to mine. Good job. Thanks for your response all helpful information. It is adorable though and worth the extra work I think. I hope you get this? Im emailing from the uk! Having googled this pattern for a friend of mine.she had started this project from crotchet world but has lost te pattern for the elephants legs and face!! As it is an american magazine its so hard to get hold of a copy.is there anyway you could very kindly email the middle pattern.she can find the first and last, but has lost the middle. That is so cute. I think I only got one of the issues. Which issues were they in? my goodness, what will they think of next!!! Novel idea! I am in the process of making this pattern for my 6 month old grandson but the Agust issue I has has gone missing and I need the last part!!! Anyone have a copy that they can email me so I can finish it for Christmas? It would be greatly appreciated! That is really cute..Great job.. Thank you I know I have one issue but I moved and can't even find it.LOL living in boxes up past my head. Need help with the tree top. Not really understanding how to do it. Can someone help me? I am assuming you are having an issue with the cap part. If I remember correctly it is in 2 parts...one inside and one outside. After making them put the smaller one right side out inside the right side out larger part then whipstitch them together. Then add the leaves starting largest at the bottom to smallest on top. I was a fun piece to make and I loved the way it came out! Thank you. I made one before, but couldn't remember how I did the tree top. Samontario, what are you talking about? The treetop instructions are written for one piece, not two. I found comments by the designer of this pattern on facebook and she confirms it is one piece (although her explanation is still confusing, which is why I am here). Now I feel even more lost. Figured it out via a some of the pattern writers comment combined with pinterest photo. It is done all in one piece, and it ends up looking like a cone with a rounded/cupped top. When the crochet is near completion you need to push in the rounded top so it looks like a bowl, and fold the cone part over it so it then makes a cone whose sides you can fill with stuffing, and then the last few crochet rounds will stitch it shut, so you end up wih a plush cone shaped cap. I hope that made sense. Not quite sure how else to word it.